This small piece is ready to do a lot of work. This full-tang blade is forged from 1084 high carbon steel that has been edge-quenched and has a hand-rubbed finish. The knife also has forge marked/acid soaked flats for a cool look as well as a "jimped" spine for comfort and control. The handle scales are done in "Lava Flow" Kirinite and are secured with a stainless steel handle bolt and matching lanyard liner (with fancy fob). The knife has a 2" cutting edge and an overall length of 5 3/4". The knife comes with a molded black Kydex sheath with removable/reversible belt loop. This little caper blade is forged from 5160 high carbon steel and done with an antique finish. The blade is flat ground with a convex edge and a slight top bevel on the spine. The contoured guard is stainless steel. 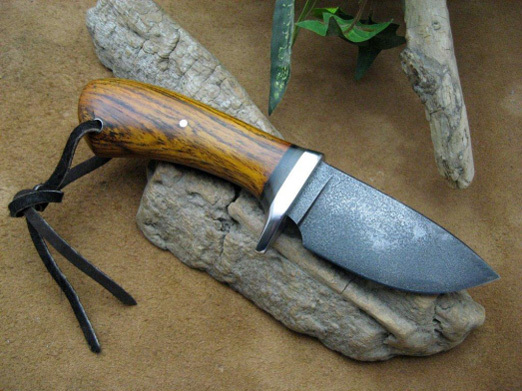 The handle is Cocobola wood with a throat of stabilized Honey Buffalo horn and a black spacer. The knife is finished up with a stainless steel pin and lanyard liner. This piece is 7 1/8 overall with a 2 5/8" cutting edge and comes with a tooled leather pouch sheath with a belt loop. This knife is one big handful of coolness. 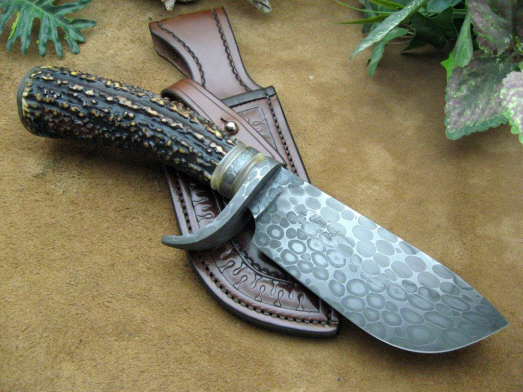 This big Skinner/Caper has a 5 1/2" blade (2" at it's widest point) forged from 52100 ball-bearings and 1095 high carbon powder steels forged in a canister weld. The "trigger" guard, throat spacer and threaded pommel are also from the same billet of ball-bearing damascus. The handle is an A-grade Sambar Stag taper with the pommel file-worked to match the stag. The front spacer is sandwiched by two fullered and stabilized spacers of Blonde Buffalo Horn as well. This knife is approx. 11 3/4" overall and comes with a tooled leather blade sheath with belt loop and retention strap. This Skinner style knife has a 5 5/8" blade forged from W2 high carbon steel. The blade is clay-quenched with and etched hamon (quench) line and has acid etched and forge-marked flats. The contoured guard and set pin are silica bronze. The handle of this knife is stabilized A-grade Cherry Burl wood. 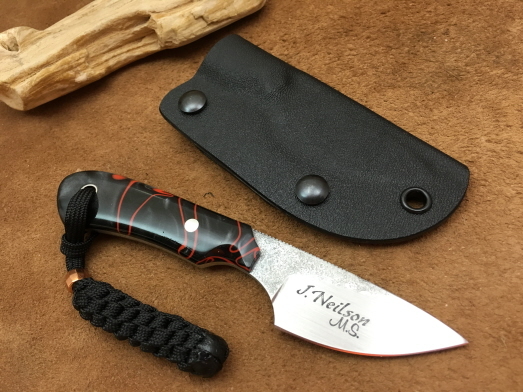 The overall length of this knife is just over 11" and it comes with a fully tooled leather pouch sheath. This Skinner knife is forged from 1084 high carbon steel with an etched than hand-rubbed finish. The knife has a 3 7/8" cutting edge and has an overall length of 8 3/4". The handle scales are stabilized California Buckeye Burl wood shaped in a "palm-swell" style and set with three stainless steel handle bolts. The knife comes with a border tool leather pouch sheath with belt loop. 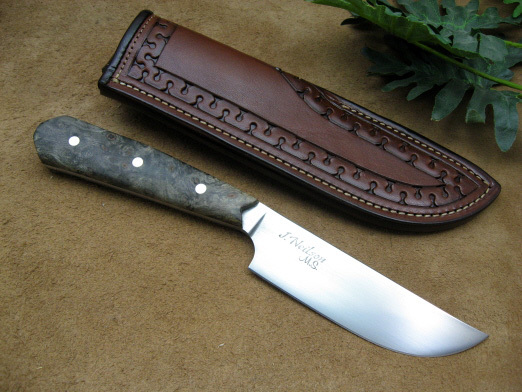 This knife is a combination Trailing Point knife with a deeper "Sow" belly, a really nice blend of both styles. The knife above has a 608 layer high carbon damascus 5 5/8" long with an overall length of 10 1/2". The oval guard is "wagon wheel" wrought iron with file worked accents. The handle is top grade Maple Burl wood with a throat of Buffalo horn (both are stabilized), black/copper spacers and a stainless steel pin. 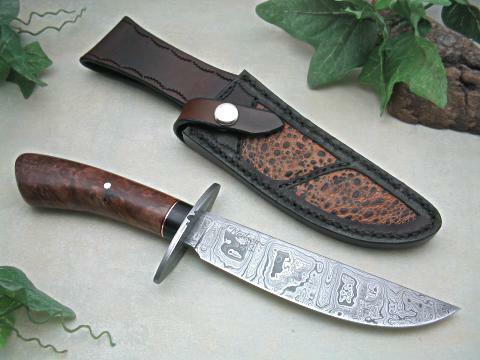 The tooled leather blade sheath comes with exotic skin inlays. 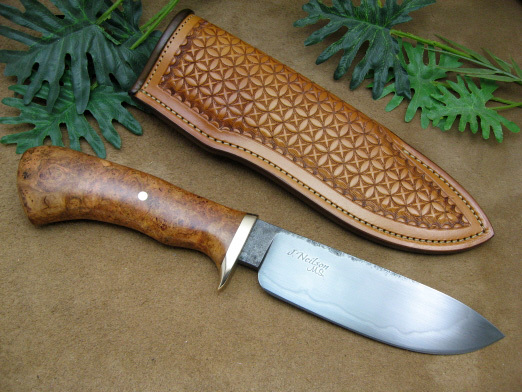 This skinner blade is based on a pattern I came across by a maker that has passed on by the name of M.W. Seguine (Juneau, Alaska). I loved this particular heavy skinner pattern so much I had to try forging something similar in my own style. 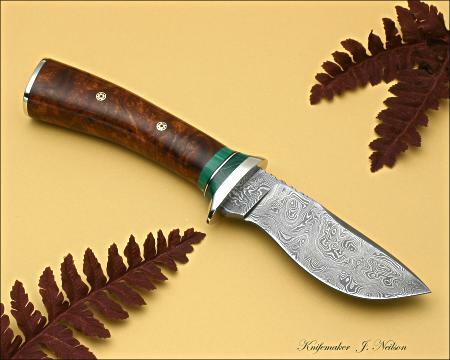 This skinner has a 4 1/2" blade of 350 layer "double-cut" damascus steel with file-work and top bevel (roughly 10 1/4" overall length). The handle is Desert Ironwood Burl with a throat of Malachite stone, nickle-silver and black spacers, mosaic pins and a guard and pommel of nickle-silver. The handle The knife comes with a tooled leather blade sheath.